As a half dozen women worked through nine stations of hydraulic training equipment Friday at the Highland County Senior Citizens Center, staff members from The Laurels of Hillsboro were on hand like they are each Friday to offer whatever assistance they could and answer questions. Jeff Swayne, rehab service director at The Laurels, said it’s a way to offer a community service and familiarize people with the skilled nursing and rehabilitation center. 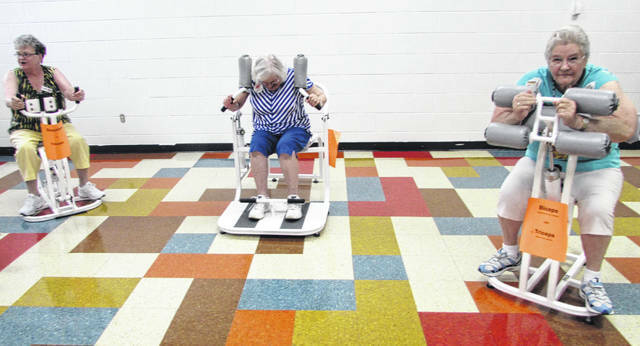 Mechell Frost, executive director at the senior center, wants to see the exercise program grow, too. Earlier this year, the center purchased the equipment from PACE Ladies Fitness in Hillsboro after the owner decided to concentrate more on personal training. The center cleaned and rehabbed the equipment, created a special room to house it, and now about 70 people use it on a regular basis. Frost said the equipment is nice for people a little older because it is gentle on the body’s joints. Users push and pull against hydraulic resistance, but since there are six different difficulty settings, it can also be beneficial for the younger age group. Anyone using the equipment has to be a member of the senior center. But a typical membership is only $20 a year for those 50-89. There is an associate membership that costs $25 annually for anyone 21-49, and membership is free for anyone 90 or older. The equipment is available for use from 8 a.m. to 4 p.m. Monday through Friday. Swayne said the Laurels started helping with the program in May. He said that Angie Adams, who worked at Highland District Hospital for several years as a physical therapy assistant and now heads outpatient services for the Laurels, is in charge of what The Laurels does with what the senior center calls its STRONGER program. He said that about every quarter year the Laurels wants to work in something new at the center, like possibly balance training or falls management. The Laurels has staff members at the center each Friday from 12:30 to 1:30 p.m.
Swayne said having staff members at the senior center weekly is a good for The Laurels and the center. Frost said the center is offering a membership special during September. Anyone that purchases a 2019 membership during the month can also use it for the remainder of 2018. She also said the center will have special offers on Senior Day at the Highland County Fair, Monday, Sept. 3. Anyone can park at the senior center starting at 7:30 a.m. and get a ride to the fair with The Laurels. The center will also have a booth at the Merchants Building at the fair that day from 10 a.m. to 4 p.m. and anyone signing up for a new membership will get a goodie bag while supplies last. For more information call the center at 937-393-4745. Reach Jeff Gilliland at jgilliland@timesgazette.com or 937-402-2522.